Monarch butterflies have been in the news a lot lately and kids are curious about them. At the same time, events like Groundhog Day can also get youngsters wondering about where other animals go in the winter. Today at Wrapped in Foil blog we have two new books that highlight the monarch butterfly and reveal many aspects of its life. 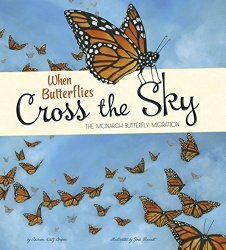 When Butterflies Cross the Sky: The Monarch Butterfly Migration (Extraordinary Migrations) by Sharon Katz Cooper and illustrated by Joshua S Brunet follows a female monarch on her annual migration. With lush oil, acrylic and pencil illustrations, and a narrative-style text, this book is definitely one to pull out for young readers who say they don’t like nonfiction. It is so beautifully done, they are sure to be won over. 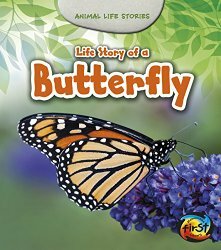 In contrast, Life Story of a Butterfly (Animal Life Stories) by Charlotte Guillain will appeal to those young readers who consume books for information. It is illustrated with bright, colorful photographs, emphasizing those of monarch butterflies and their offspring. Both books cover the life stages the monarch and talk about the migration, but Life Story of a Butterfly gives much more detail about the life cycle, and When Butterflies Cross the Sky concentrates on the migration. What perfect titles to get us in the mood for spring!